The Flower Soft team is hopping today...! Today we're showing off our Flower Soft stamps with the theme"Winter Chill"! 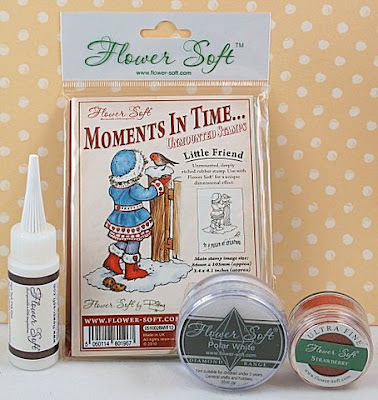 Flower Soft is also sponsoring The Daily Dare’s 12 Days of Christmas. So from here, go check out today's challenge for another chance to win a fabulous Flower Soft prize!!! There are 12 days of challenges lined up with some wonderful sponsors. If you arrived here from Cibele's blog, you're on the right track. If you just happened to stop by, you may want to start from the Flower Soft Blog to make sure you don't miss a thing... because prizes are involved!! I used the "I Love You" stamp set on my card, and watercolored the image using reinkers. I used Crystal Lacquer on the windows, and lightly sprinkled Polar White while the Crystal Lacquer was still wet. The Sage Ultrafine Flower Soft was my attempt at a cozy shag carpet... not sure if we accomplished that or not, but that was the idea! I'm glad you stopped by... hope you enjoyed the hop! Remember to visit The Daily Dare’s 12 Days of Christmas, too, after you leave a comment here! So darling, Dini! I love your shag carpet idea! Looks great! Merry Christmas, and Happy New Year, friend! What an adorable card and adorable image. I LOVE your shag carpeting! I have the sage FS and it's such a fabulous color -- perfect for sooo many applications!!! Your colouring is so soft and pretty! Lovely work Dina! I love how you colored that cute image! Great job! Love the colors you used in your card. Very pretty and soft. Your carpet does look like shag, so yes you did accomplish that. ;0) Love it all. Thanks for sharing. This is such a cool card, love it. I love the coloring and the inside of the card is a great idea. Cute card. TYFS. Best Wishes for a blessed 2011. Lucinda. Such a cute stamp and I love that green carpet. Great job Dina. I like how you did the windows. Adorable image and I love the "shag" carpet! What a cute idea! Beautiful card and your color palette is just wonderful...Hugs for the new year.